Welcome to Reboot Health. I'm Sara Davenport and in 1998, I founded the Breast Cancer Haven charity, which offers advice, counselling and complementary therapies to anyone affected by breast cancer, free of charge via its six centres across the UK. Through three decades of work with doctors, nutritionists and therapists, my overview of both traditional and complementary medicine led me to write my first book - 'Reboot Your Health: Simple DIY Tests and Solutions to Assess and Improve Your Health' (published by Hay House in June 2018). 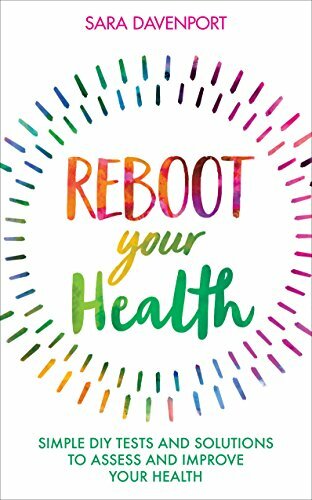 From nutrition to detox, sleep to air pollution and the best health tests on the market, Reboot Your Health delivers the low down on conventional medicine and complementary therapies, helping readers to benchmark their health while offering suggestions for simple, inexpensive and natural remedies that really work. Doctors frequently talk about ‘False Hope’. I don’t personally think there is such a thing. Hope of any kind, false or otherwise, gives each of us a reason to struggle forward. What if I told you that there seems to be a simple, non-invasive and relatively inexpensive machine out there that, according to anecdotal evidence, seems to alleviate insomnia? And best of all, with absolutely no side effects of any kind. GET 'HOPE FOR INSOMNIACS' NOW - CLICK HERE! Get Wise, Get Well is an exclusive eBook packed with information and advice on how to fine tune your mind and body for optimum health and fitness. When I wrote Reboot Your Health my goal was to put you in charge of your own health, to empower you to take control where you can and inform you about the fascinating yet often confusing world of health. Summer is a great time to start. What better time to focus on what’s good and healthful? Are you always tired? Do you have unexplained aches and pains that just won’t go away? Do you suffer from fibromyalgia, or chronic fatigue? Breathing problems, coughs, wheezing and allergies? Asthma? Brain Fog? Is your memory no longer as sharp as it used to be? Do you get those momentary brain ‘blanks’ and are you more anxious or depressed than ever before? Have you ever considered that your problem might be mould? Mould: The Invisible Menace brings together the latest research from scientists and mould experts to provide you with a basic introduction to mould, and give you the tools to heal yourself. Understanding Alzheimer's is a comprehensive look at the most up-to-date research into this devastating disease. As well as the early symptoms and effects of Alzheimer's, the book itemises some of the supplements and treatments thought to improve sufferers' symptoms - useful if you're worried about your own health or that of someone you know.